"Improvements in Advertising or Signalling"
Electric signs are not telegraphic, but they can be programmable, and their use of elemental units does relate to the "elementary sign" printing "types" described elsewhere in this section. Hence, I include four specifications for electric signs designed to display a succession of letters and other forms using the same set of elemental shapes; in some cases, their mechanisms are controlled by perforated tape. The Current US Classification for these patents is 40/452 (40 : Card Picture or Sign Exhibiting. 452 : Changing exhibitor, illuminated). A close examination of Class 40 might well yield additional specifications involving elementary signs for letters. Many of the patents in this category emphasize the letterforms themselves, rather than the "programmable" switching mechanisms. Certainly, the purpose of these devices is quite different than the Dean and other "high speed printing telegraph" systems. Moreover, these printing telegraph systems offered only the most primitive letterforms. In contrast, many of the sign patents give more attention to letterform design features for what are, after all, "display" faces. Note that the lamps are not arranged in perfect symmetry. Shown at left is the elevation and profile of the contact disk, together with the rotating contact-arm B. 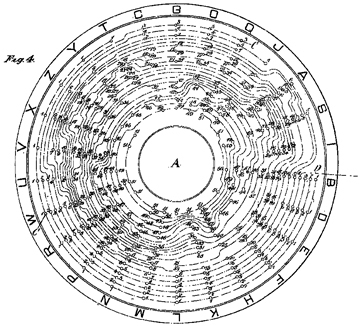 The contact disk contains the "program" for every letter, and might even be arranged "to suit the order of letters required" where 'set" advertisements were to be reproduced. The disk is akin to perforated tape, which is incorporated in the Hildburgh system. Raleigh makes much of the economy of bulbs achieved by his "artistic" spacing. "The letters, moreover, instead of being of grotesque or unnatural formation retain their well known configuration -- rounded curves and straign lines -- the lamps constituting the same being equally and artistically spaced. No useless lamps in any letter are illuminated, and with the aid of the improved designs constructed according to my methods, the maximum amoung of definition is obtained with a minimum number of lamps." Nesbitt's specification does not provide for an entire set of 26 letters and figures, but is designed specifically "to flash Beer 5c" (1:52) -- that is, with the letters B E and R, and the figure 5. Yet he allows that his device could, with the addition of "other partitions and electric light bulbs," show other letters such as C D F G H I J L O P Q S U. We note the absence of A K M N T V W X Y and Z. The "cent" sign is treated by means of a "stencil cut" letter in a tiny "section 9." See Faulkner's US/1924/1,504,112 for a more complete variation on the same general principle. Figure 15 demonstrates the step mechanism that would cause the movable plate to move up or down six units on the y axis, and right or left through the 5 units on the x axis, for the respective holes in the array of "unit areas" to align against and show through the grid of holes in the stationary plate. 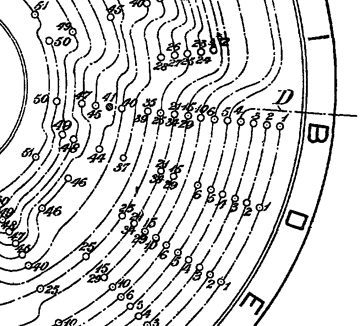 Detail of patent Figure 15, being only example of what a "movable plate" would look like. 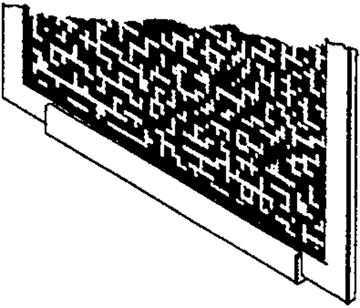 It is a large grid, composed of multiple "unit areas," each 1/2 inch wide and .6 inches "deep," and each holding a maximum of 30 "holes." This patent "relates to improvements in devices for producing changes in designs or advertising or other purposes and is especially applicable to devices in which a plurality of relatively movable plates is employed. One of said plates is provided with visual openings equally spaced in parallel lines and the other plate is provided with visual areas so arranged that, by the relative movement of the plates, some of the areas of the second plate will be brought into coincidence with some of the openings in the first plate and produce a desired image." Hildburgh's improvements relate to control of the relative movement of the plates, using code on a perforated card. While his device is not limited to letters, his example is devoted to the 26 letters, three punctuation marks, and an empty square. The image above takes the exampled unit area, and multiplies it as it might appear on an actual movable plate -- see the image from Figure 15 further above. 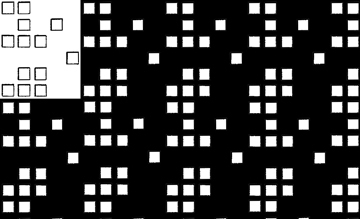 An actual pattern would be more various than is shown here because of the different values (limited, here, to black and white) required by each letter at a given x-y coordinate. The idea is similar to those provided by Ellero, Montagna and others, and summarized in the companion page for elementary signs : pictures. Figure 24, shown immediately above, is an elevation "of a portion of a movable plate." The detail of Fig. 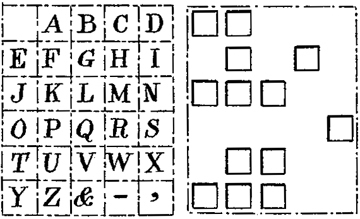 24 shows the relationship of the holes for two letters on the movable plate; it should go without saying that the array of holes in the permanent plate essentially mask all but the holes for a single letter on the movable plate, thereby making it impossible for two letters to be seen in this way. 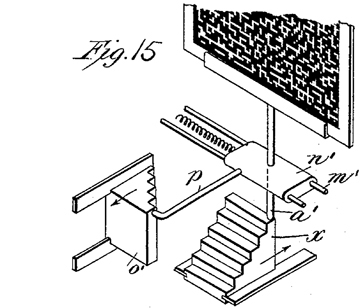 The general principles behind the Hildburgh patents appear very much later; this patent is cited by Eckert US/1981/4,246,713 (Illuminated advertising display device with changing visual effects) and Dehli US/1997/5,657,565 (Compact display apparatus). For our purposes -- elementary signs -- and notwithstanding the ingenuity of his mechanism itself, the significance of Hildburgh's ideas resides in the reduction of his alphabetical letters into pixel-like units of diameter 1 that can never be closer to each other than five diameters on the horizontal, and six diameters on the vertical (? !). Walter Leo Hildburgh (1876-1955) filed ten patents listed in espacenet, two of them for dynamo electric machinery the rest -- including two Austrian patents -- for advertising machinery. There are at least two other U.S. patents. Some archival material is at Columbia, where he trained as an electrical engineer (E.E., 1897; A.M., 1898; Ph.D., 1900). Hildburgh traveled extensively, lived in London and thanks to a modest independent income devoted his life not to engineering but to art collecting and scholarship (medieval Spanish enamels, amulets, alabasters, etc.) He was also an accomplished swimmer and figure skater, doing much to promote the latter sport, especially. 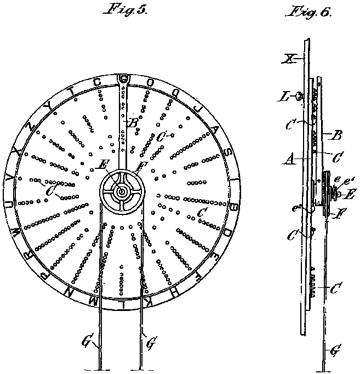 "This invention relates to improvements in illuminated signs and has for an object the provision of a single bank of lights which are arranged so that certain of the lights may be illuminated to form different numerals and letters of the alphabet, or other characters, the purpose being to arrange a number of banks together to spell out various words and sentences, which may be changed through the medium of switches and other operating mechanisms. Faulkner's light grid is ingenious, but dependent on conventional letter shapes. While it provides a type "face" with a distinct style, those same features limit its application to other shapes. Faulkner does not specify what "other operating mechanisms" would be, but we can easily imagine a contact disk similar to that described by Raleigh above, able to select the required lights for a programmed sequence of letters. Yet there is a letterspace problem -- Even from only the three letters Figs. 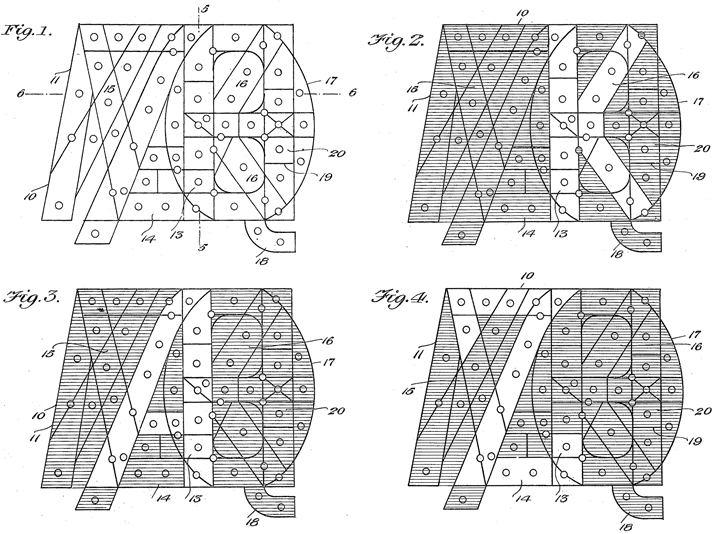 2-3 shown in the patent, it can be seen that the origin point of each letter does not stand at a consistent 0,0 -- A stands to the left of K and to the right of Z. I do not see how several banks could be arranged to solve this problem.